So are these people society's last real heroes, or degenerative eco terrorists and criminals, as would some authorities have the public believe? Sea Shepherd was formed in 1977 by an expelled Greenpeace board member and activist Paul Watson. 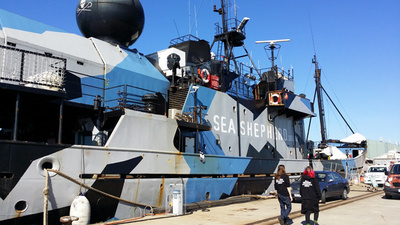 Since Sea Shepherd's formation, the organization has always been on the vanguard of direct action against seal hunters, shark finners, and whalers. What is most controversial are the tactics used such as shining laser lights in the eyes of whalers, scuttling and disabling whaling boats at port, throwing bottles of butyric acid onto vessels at sea, blocking the passage ways of ships at sea, and destroying drift nets at sea. 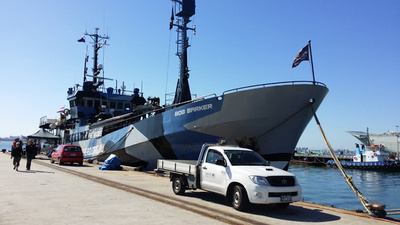 Although Sea Shepherd has received support for its tactics by many international celebrities over the years, they have been denounced by the Governments of Australia, Canada, Japan, New Zealand, and the US, where the US courts have even been prohibited Paul Watson from going near his own ships. Paul Watson has continually claimed that Sea Shepherd actions have always been against criminal and illegal poaching operations. 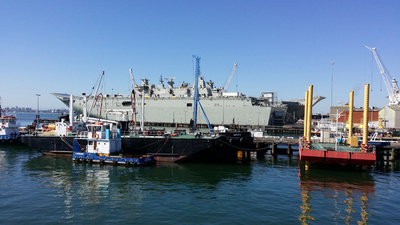 However, many critics claim that Sea Shepherd's direct action itself violates international law. 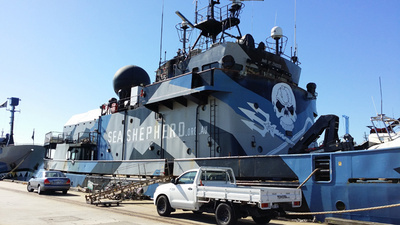 Although it has been claimed that Sea Shepherd's direct action against Japanese whaling ships has been counter-productive and strengthened the domestic resolve of Japanese for whaling, the organization has used the media very skillfully. 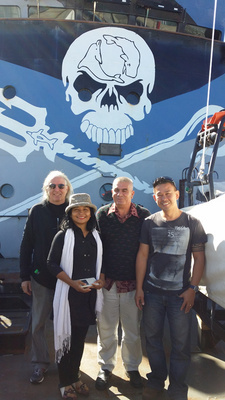 The media is an important tool for Sea Shepherd, where critics have also claimed that Sea Shepherd material is not always truthful, but rather as Sea Shepherd sees it as a necessary fiction. Nevertheless, Sea Shepherd public relations has pushed the issues of seal hunting, shark finning, and whaling to the point where public opinion has swayed to Sea Shepherd's side. The Japanese detention of two crewmembers raised public sympathy towards Sea Shepherd. Likewise the Discovery series Whale Wars on Animal Planet have helped to propel Sea Shepherd into mainstream public acceptance. 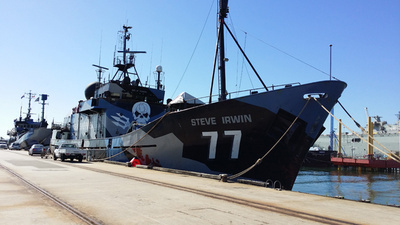 This to some point has protected Sea Shepherd's presence in countries like Australia, although internationally the Australian Government tries to distance itself from Sea Shepherd. There is a feeling that any action taken against the organization would lead to public outrage against any government contemplating to do so. Sea Shepherd is supporting bans on marine animal poaching that governments have put in place, and in this sense, Sea Shepherd is enforcing agreements that governments themselves due to political reasons are reluctant to do. However, Sea Shepherd's strategy is to stage events for the benefit of media exposure, where these often provocative direct actions have led to arrests and casualties. Whether Sea Shepherd is an organization of selfless people committed to a cause or a group of high minded pirates will depend upon who you ask. Watson himself strongly points out that it is not in the interests of his clients, the marine life of this earth to harm anybody. "You only have vigilantes when governments don't enforce laws". However Sea Shepherd's vegan crewmembers are performing a task that others like Julian Assange and Edward Snowden tried to do. To bring out the truth about what is happening in society to the public and prevent governments and corporations ignoring, or getting around the laws, that already exist. Every member of Sea Shepherd is doing their part to prevent whales, sharks, and seals from becoming extinct. They are tackling problems that most don't even know exist until it's too late. The crews of Sea Shepherd challenge the status quo of our social existence, saying by their commitment and action that they will not just accept what they are told by governments. Every time a crew member is arrested for trespassing, a Sea Shepherd ship is rammed, or a seal hunter punches a woman crew member, the establishment is challenged in a sort of Gandhian way. Where government policy and operation is dominated by political and economic considerations which tramp over individual rights, direct action by organizations like Sea Shepherd is the only way to keep governments honest. Thus organizations like Sea Shepherd from the eyes of governments are considered an enemy. Just like Assange. Just like Snowden. So paradoxically, support for Sea Shepherd is mandatory for anyone who treasures the rule of law, and the right of people to know the truth. Paul Watson, who commanded the Sea Shepherd ship Whales Forever was treated in a similar manner to Assange and Snowden. This cannot be seen more in the way the Norwegian Warship K/V Andenes was used in an effort to arrest him in international waters, which resulted in the ramming of the Sea Shepherd ship in 2012. The recent World Court verdict against Japanese whaling can in many ways be credited to the actions of Sea Shepherd in the Southern Ocean and the publicity they managed to generate. 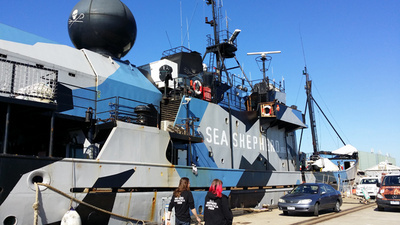 Sea Shepherd is redefining the means to achieving social justice. Sea Shepherd is not just an organization, it's a movement completely funded by the public that will influence how society will be ordered far beyond the issue of whaling. In this way Sea Shepherd is one of the citizen's last hopes in maintaining civil rights against ever more compliance demanding governments in the future.